battenburgbelle.com » Howdy y’all – it’s International Day of the Cowboy! It’s actually National Day of the Cowboy, but we are doing our bit to make it International. After the rip-roaring success of last year’s celebration of this momentous occasion, I decided to stick with the cunning plan of putting my feet up and getting my chums to bring a dish each. 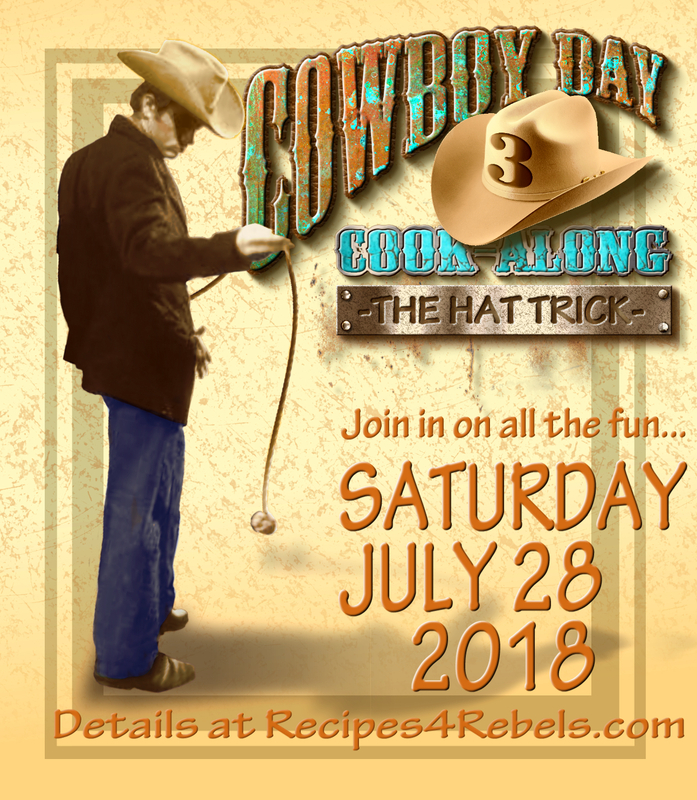 Jenny and I will both otherwise engaged on the day itself (last Saturday in July – in case you want to host your own celebrations) – I’ll be in the USA itself, hoping to meet some actual cowboys. So we had to have our event early – we couldn’t possibly miss the lovely Greg’s cowboy day cookalong. It was only after I’d sent the invitations out that I realised it was the same weekend as the Muswell Hill and District Horticultural Society Summer Show. Regular readers will know that Jenny and I are slightly obsessive about the cookery competition, although after a couple of ridiculous baking marathons, we made a pact to enter no more than five items each, which means we do get to sleep the night before the show these days. Once I realised my diary faux pas, I decided there was only one solution – go Tex Mex for the show. Fortunately there is an “any other” category, so I made Pastel de Chocolate Mexicano from my lovely friend Roger’s book – the World’s Best Cakes. I’m not on commission (Roger???) but if you like cake, you’ll love this book. This is a quick and easy recipe – what took longest was googling what to use instead of chipotle chilli flakes, which I’d left it too late to buy. After much research, I used cayenne pepper. I had no idea how spicy or otherwise the cake might be, so it was with some trepidation that I submitted it to the scrutiny of May, the idiosyncratic judge of the cookery competition (she once dismissed out of hand the smoked haddock and leek tart I entered in the savoury tart category, on the grounds that she “doesn’t really like fish in a tart” and despite the fact that it was bloody delicious!) And there was me thinking it was all about the quality of the cooking… Anyway I’m not bitter and nor was the cake. It was in fact awesome and came first. 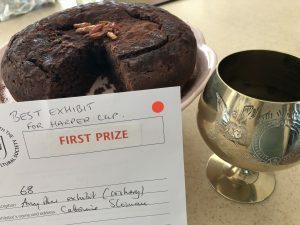 May loved it so much she awarded me the Harper cup for best item in the cookery classes  So there was one cowboy-appropriate dish sorted. Preheat the oven to 170ºC/gas 3. Grease and line a 15cm round cake tin. Melt the chocolate in a heatproof bowl over a pan of simmering water and, when melted, add 1 tbsp milk. Mix until smooth. Remove from the heat, add the chipotle chilli and set aside to cool slightly. Pour the remaining milk into the chocolate and mix well. Add the sugar and oil and mix well again. Whisk in the egg until light and frothy. Add the dry ingredients and fold well. Pour the mix into the tin and bake for 30 minutes. When cool, decorate with cocoa and chillies. I woke up on the day feeling that just offering cake would be poor hostessing, so I decided to rustle up James Garner’s chilli from Jenny’s fantastic Silver Screen Suppers blog. This is truly the best chilli I have ever tasted. Some technical hitch on Jenny’s blog means the ingredients are listed but not the method. I used my imagination and was very pleased with the results – it certainly has a kick and the honey gives it a lovely sweet undertone. 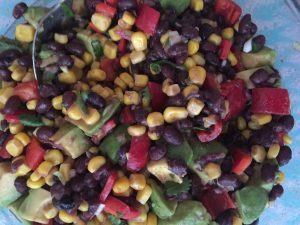 Everyone brought excellent dishes – I’ve been eating cowboy salad all week (black beans, avocado, corn, stuff like that). We had three of those this time, all slightly different and all lovely. There was Mexican creamed corn, guacamole, salsa, a veggie chilli, another meat chilli – everything a cowboy might desire. Well possibly not everything, but it was a fine feast. Davie brought his guitar along and treated us to some foot stomping country music, for which we all donated to Alzheimers Research UK. Even cowboys get the Alzheimers, right? That sure was one hellova party pardner! So much fun and so much delicious food. Yeehaw!